LOUER 2 NUITS OBTENIR LA 3ÈME NUIT GRATUITE POUR LES SÉJOURS EN AVRIL ET MAI 2019 SUR LES NOUVELLES RÉSERVATIONS UNIQUEMENT LE PRIX SPÉCIAL. VACANCES, ÉVÉNEMENTS SPÉCIAUX ET WEEKENDS EXCLUS. VOUS DEVEZ NOUS CONTACTER PAR E-MAIL POUR OBTENIR LA NUIT GRATUITE. Large (1900 sq. 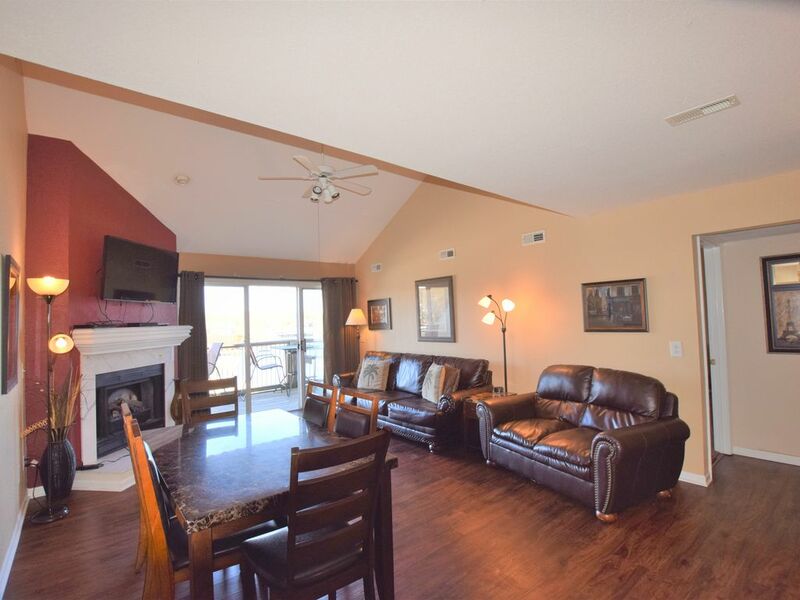 Ft.), Condo au bord du lac situé au cœur de Osage Beach, MO. Ce condo étage offre une vue imprenable sur le lac des Ozarks. décorées avec goût et condo très confortable avec toutes les commodités de la maison. Profitez de griller et de détente sur le pont spacieux tout en regardant toutes les activités de navigation de plaisance. Ce complexe dispose de deux piscines et d'une plage bien entretenu de sable avec une aire de jeux pour les enfants. Tous à une distance de marche très courte. Ceci est un condo de bain 5 chambres, 3 qui comprend une suite de maître sur chaque niveau avec salle de bains privative. Ce condo est parfait pour les réunions de famille. Au niveau principal, il y a une chambre de maître avec un lit king et salle de bain privée avec baignoire / douche. Aussi à l'étage principal, deux chambres, chacune avec un lit queen. Il y a une salle de bain avec une baignoire / douche situé dans le hall. Dans le niveau supérieur, il y a une suite de maître avec lit king et salle de bains privative avec une grande douche. Également dans ce niveau supérieur, sont deux grands lits, coin salon avec 2 chaises et TV 42 pouces pour les enfants à regarder leurs émissions préférées ou des films. La cuisine est entièrement équipée avec un batteur, mixeur, cafetière, et toutes les commodités de la maison. Ce condo a un plan d'étage ouvert qui permet à chacun de visiter tandis que dans la cuisine et le salon. Le salon / zone a une belle table en faux marbre qui peut accueillir 6. Le mobilier dans le salon est tout neuf et très confortable. Nouveau revêtement de sol et moquette (2017). Le salon et la chambre de maître principal de niveau ont de grands téléviseurs à écran. Toutes les salles de bains sont équipées d'un sèche-cheveux, d'un gel douche, d'un shampoing et de papier toilette. Bateau glisse disponible sur demande pour 20-25 $ / nuit. À quelques minutes de l'autoroute 54 et de la promenade Osage Beach ... située au cœur de la plage Osage. Golf: De nombreux terrains de golf à proximité. Demander à Gary des recommandations. Location de bateaux / motomarines: deux marinas à proximité ont des bateaux de location et motomarines. 7 minutes de Tan-Tar-A: pratique pour les conventions et le parc aquatique intérieur. Family Fun: mini golf, 2 piscines et une plage de sable sur place, karts à pédales, à proximité de Miner Mike's & Busters (parc d'attractions couvert et piste de karting). Thank you for your review & positive feedback. We greatly appreciate you taking the time to post the review & hope you consider staying here again on your future trips to The Lake. We enjoyed our stay. Condo was clean and cozy. We were a party of 6 adults and yes like he says you can only shower about 2 or three after no more hot water. The pictures show carpet in living room but there is vinyl now. (Just thought I mention that). The only thing we thought negative about this place is that there is too many rules on the cleaning part. Why pay $110 for cleaning fee when you pretty much have to leave the place spotless or else you pay for it. other than that clean and cozy. Thank you for letting us know about the water heater. The water heater was replaced in 2018 & is 50 gallon WH. We did have the elements checked following your stay. We do recommend spacing out showers on our paperwork sent out. Regarding the cleaning "rules", we ask the guests to remove their trash bags from the condo: to keep insects, pests & smell at a minimum, therefore preventing the next guests from a disappointing stay & our cleaning crew doesn't have the capability to remove several large bags of trash. We also ask to run the dishwasher & empty, if possible. Other than that, we only ask our guests to treat our condos with respect. It takes our cleaners 4-5 hours to clean the condo, do the laundry & have it ready for the next guests' arrival. Perfect For Our Girls Weekend-4 BRs + Loft w/2 Beds + 3 Baths WOW!! Very clean and plenty of room for the seven of us. Only two of us had to share a bed, but it was fine because it was king size AND it had it's own private bathroom. There were actually TWO master bedrooms. We did have one hiccup (a smelly dishwasher from previous renters), but the owner responded IMMEDIATELY. (Thanks, Gary!!) Everything was resolved when we returned from a day of shopping. Unfortunately, this was an autumn trip instead of a summer trip because the deck was WELL appointed with lots of seating and table and grill and we couldn't take advantage of it. The table was big enough to seat all of us when we played games in the evening after dinner. The location was great as well. Central to great restaurants, shopping, gas stations, hospital (if needed). Easy to find: Hwy 54 to Nichols Road to Dude Ranch Road to Ledges Drive. Building numbers clearly marked. Parking right outside of condo. glad the condo accommodated your needs so well. We look forward to your group to return on future trips to The Lake. Great, our family just loves coming here. We have been coming here many times and we always love our stay and the condo is very clean. Thank you so much for your 5 star review & many years of loyal patronage! We look forward to return visits next year. Plenty of room, great time. Thank you for your 5 star review of our condo! So glad the condo accommodated your group. We hope you come visit our condo & the lake again. Don’t park outside the lines they will tow your vehicle. He was particularly outside the line but my son in law’s vehicle was towed. $230 to get it back. No sticker no warning done in the middle of the night. The Ledges Condos have several signs designating no parking areas & warnings about towing if violated. The condo complex does this for several reasons during the summer months: groups have several vehicles in their party; over-sized vehicles make driving through the complex difficult; being courteous to all guests to have at least one parking spot near their condo. We also include that information in our condo & paperwork that is emailed before your arrival. He was parked in a manner that did not meet the requirement on all the signs posted in the complex. Nous sommes au cœur de Osage Beach, MO. Telle est la principale zone touristique au lac des Ozarks. Nous sommes à quelques minutes de toutes les attractions: Outlet Mall, shopping, restaurants, épicerie, vie nocturne. Minimum rental age is 25. Must comply to our separate damage agreement as stated in the House Rules area. Credit card held on file for damage deposit of $200. Your card will not be charged but will be pre-authorized. Minimum stay may vary during the summer months at Manager's discretion.